It's just so darn stinkin' cute! 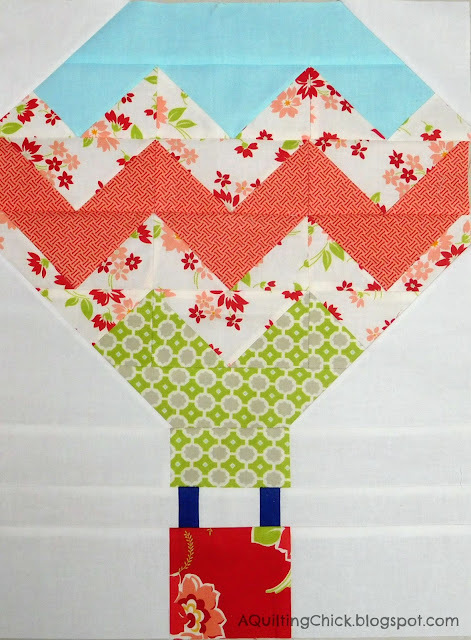 I'm loving the fabrics (Miss Kate) and the designs and cannot wait to see it finished!! No idea what I'm working on tonight but we leave to take Cassidy to college on Thursday so I'm going to try to keep it simple, whatever it is. What are y'all working on today? Don't forget that I'm offering 20% off your purchase in my Etsy shop to celebrate the release of Delectable Flowers! Just use coupon code FLOWERS20. 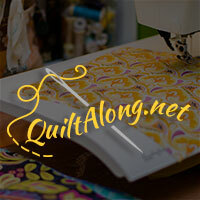 Today I'm linking up with Fabric Tuesday at Quilt Story, Show and Tell Tuesday at I Have to Say, Linky Tuesday at Freemotion by the River, and Sew Cute Tuesday at Blossom Heart Quilts. I love this block! Great job! I just love the fabrics too!! It just makes me feel like summer- great job! Love your balloon! The Bristal Balloon Festival was last weekend, lots of hot air balloons floating in the Somerset skies :) The Miss Kate line is lovely, works so well with Snapshots. What a beautiful balloon! Those fabrics are all so yummy!